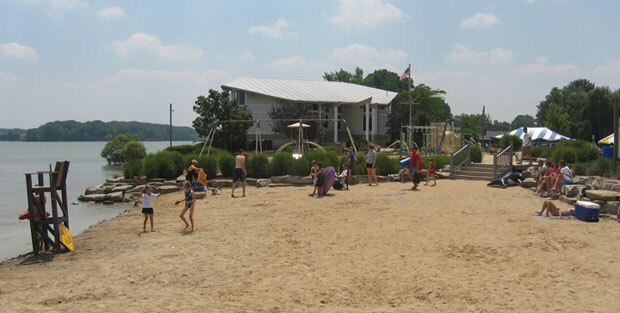 Aurora Shores has two beaches and two pools for the enjoyment of homeowners, their families and guests. The Tradewinds pool offers swimming lessons to residents and is also used by the community swim team . A second pool is located by the Marina Beach with beautiful views of the lake and access to the beach playground, tennis courts, sand volleyball court, and basketball court. Boater's Beach is located on Surfside Circle. One lifeguard will be on duty at the beach during the above hours. Members using the beach or pool will be required to display current membership identification and complete a sign-in sheet. Six guests per family are permitted. ASHA does not accept responsibility for valuables. No one is permitted in the pool unless a lifeguard is on duty within the pool area. Any use of the pool at times other than regularly scheduled hours is expressly forbidden. Any lake swimming, other than when a lifeguard is on duty, is at the swimmer’s own risk. In order to insure safety, the lifeguard may require a swimmer to demonstrate his swimming skills by swimming two lengths of the pool without stopping. Those who cannot pass this test must remain in shallow water. Pool furniture may not be removed from the deck area. Children under 10 years of age must be accompanied by and watched by an adult. All injuries and accidents must be reported to a lifeguard immediately. Persons suffering from communicable diseases, skin disease, sores, or fungus infections, etc., are prohibited from using the pool. Except for Seeing Eye Dogs, pets are not permitted within the fenced area of the pool or on the beach. All littering is strictly prohibited. Offenders may be asked by the lifeguard to leave the beach or pool. Free floating supports, rafts, balls, etc., will be permitted in the pool at the discretion of the lifeguard. Beach toys are not to be used as life preservers. There will be a ten minute rest period every hour, during which, only persons 16 years of age or older may use the pool. The lifeguard, at his discretion, may occasionally increase this period for adult swimmers and/or allow parents to work with children on a one-on-one basis. Lifeguards are authorized to restrict any behavior they judge as unsafe or disruptive. Horseplay is not permitted in the pool areas or on the beach. 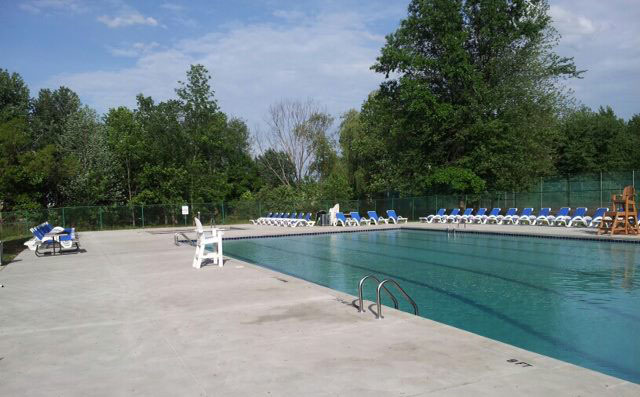 The pools and lake will be closed during inclement weather. Children under 7 years of age must wear life jackets when in the water at the beach. The pool and lake will be closed during inclement weather. All people using the pool or beach must be in proper swimming attire. Hemmed cut-offs are acceptable. A roped-in area is provided at the marina beach for swimmers and is protected by lifeguards. Swimming beyond this area is at your own risk. In the event of an emergency, all patrons will be asked to clear the swimming area. Lifeguards are not responsible for guarding the wading pool. Children in the wading pool must be supervised by an adult at all times. Lifeguards are responsible for the enforcement of all the above rules and any new rules which may be adopted at a later date. The failure to abide by these rules may result in suspension of pool or beach privileges. Visiting with on duty lifeguards is prohibited. Alcohol and controlled substances are not permitted at the pool areas or at the Marina beach area. Smoking is not permitted in the Tradewinds Clubhouse, on pool decks or on beach. Guests must be accompanied by an ASHA member displaying current membership tags.